ï»¿ Does Google Love Your Competitors Websites More Than Yours? OUCH! Does Google Love Your Competitors Websites More Than Yours? More than you. And that hurts. That hurts because they're getting more clicks, more cost-free visitors and ultimately, more new customers & clients. Customers that you could have. 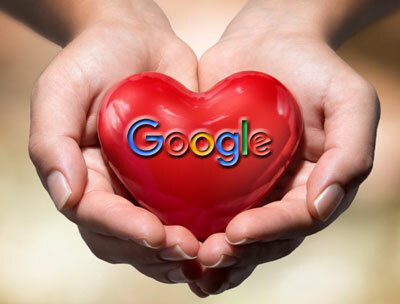 So What Are They Doing Differently To Make Google Love Them Over You - And More Importantly - What Can You Do About it? Google's algorithms are top secret and guarded more intensely than the Coca Cola recipe. But having spent over 15 years getting sites ranked in Google and working with 100's of clients, it goes without saying we've discovered a few things. In some cases, quick tweaks could see your website jump many places in Google. The secret is knowing what needs tweaking. Here's 9 of those factors that could make a big difference to where your website ranks. Site Speed. Google is fanatical about how fast website's load, as slow websites spoil the user experience. Especially true for browsing on mobile devices, something which is constantly on the increase. So don't expect to rank well with a â€œhuffing & puffingâ€� slowcoach of a website. Faster hosting. Optimised Images. Streamlined Code. They all help make your website rocket fast. Mobile Optimised Website. Depending on your market, mobile visits could make up anything from 20 â€“ 50% of total visits. If your site doesn't work well on mobile, it won't rank. Make sure it passes the Google Mobile friendly test here. Over Optimisation. In 2012, Google released the over optimisation penalty, designed to punish those who simply went to far with their SEO efforts and over did it. It can be a tricky one to identify, and the threshold can be different in each market, but essentially relates to the over use of a keyword or keyword phrase) through several points of a webpage including page url, page title, H1 tags, external links and more. Keyword stuffing in the webpage content is also a factor. It's a common reason why some websites get stuck on page 2 or 3 of the search results, so if this is you, get some specialist help. Duplicate content. Google's Panda algorithm looks for signs of low quality content, and one of those is duplicate content, where a website repeats blocks of text on different pages of the site. Can be tricky to find on larger websites without the right tools, but once rectified, we've seen websites bounce back quickly. Topical Relevance. Google's aim is to list the most relevant websites relating to a keyword search, because that's what keeps it's users happy. However, many businesses offer varied products and services, which means establishing tight topical relevance is hard, leaving Google unsure what the website is about. Fortunately, some re-structuring of site content, together with the addition of some topical relevance indicators, can solve this issue. Visitor Behaviour. Google now has the capacity to record certain user metrics of your site (where the visitor found you via Google), ranging from the time spent on your site, to click through rates. If visitors are finding you on Google, clicking through but then quickly clicking back to the search results, it gives the impression your website is not a relevant result for that keyword. At best, it could keep you going higher, at worst, it could see you drop in the rankings. A deep delve into site analytics data is required to conclusively diagnose this issue, but in most cases improving the user metrics is a better way to spend time. Negative SEO. A phenomenon that arose back in 2012, whereby it became possible for someone to â€œattackâ€� a website by obtaining huge amounts of low quality links to it, making it appear to Google that the owner had engaged in shady spam practices. The result is demotion in the rankings -and occasionally â€“ complete de-indexation of the website. A thorough backlink analysis usually reveals if this has occurred. If it has, an extensive backlink audit is needed, followed by notification to Google of the offending backlinks. If your industry is know to be unscrupulous, it's worth checking. Local Ranking Signals. If you operate in a local area, then lack of local signals could be holding your website back. These range from Geo-tagging images, through to Schema Mark Up code, citations (name, address, phone number listings) on external websites and Google Maps mentions. Trust & Authority. Google seeks to rank the most trusted websites, and it determines trust by what websites link to you. If all other factors are equal, then it comes down to trust & authority. And these â€œscoresâ€� mainly result from the â€œvotesâ€� (backlinks) you get from other websites, and their â€œvotesâ€� are weighted depending on their trust & authority. In short, links from authoritative, trusted websites like BBC, The Guardian, etc generally give your website more ranking power. And while they may not have links from the BBC, if your competitors have been getting mentions on other websites, it may be a reason they have more ranking power. These are just a few - and by no means all - of the reasons your site isn't ranking. In reality, Google looks at well over 100+ different ranking factors. That's why it's really vital that you know every little thing about your website that could be affecting how much love Google gives you. A full Search Diagnostic Audit will dig deep and find out what is causing Google to spurn your website. Armed with that golden information, you can then tweak your website and watch it perform better in Google and be getting more customers. Without this information, you are just flying blind. Your competitors, on the other hand, are not. Digital Edge is a Certified Google Partner and Qualified Adwords Company.